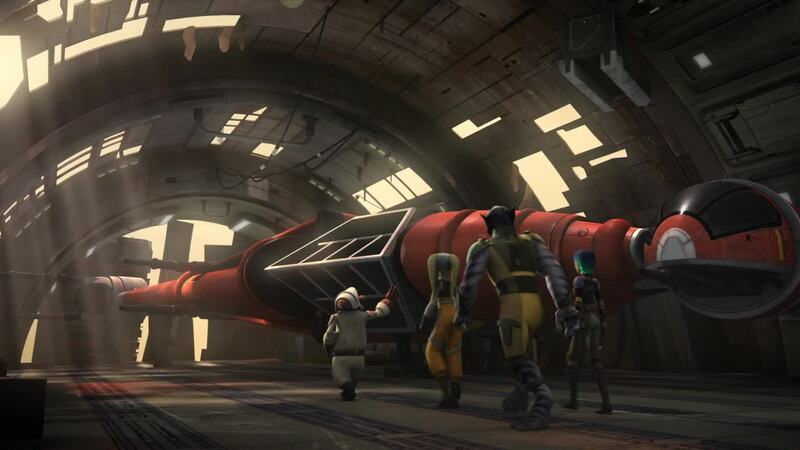 This past week, Star Wars Rebels brought out of the shadows one of the coolest and most unique of Rebel starfighters, the B-wing. The craft, a longstanding part of the veritable “alphabet soup” that is the Alliance Starfighter Corps, hasn’t received much love compared to its far more common & iconic cousins over the years, but that has begun to change in the new canon that has cropped up in the leadup to The Force Awakens. 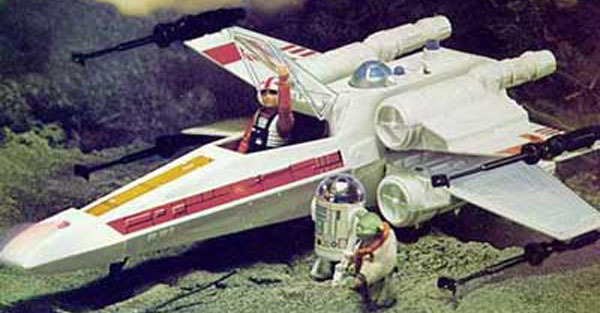 While nearly anyone can recognize an X-wing, the B-wing fighter has been overlooked and in the shadows since its appearance back in 1983’s Return of the Jedi. In honor of this awesome craft and it’s newfound glory, let’s look back at the history of the B-wing over the past thirty-plus years. 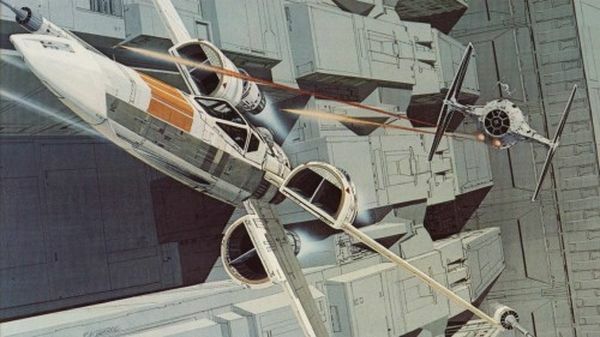 The B-wing began its life as concept art for Return of the Jedi. Designed by artist Joe Johnson & ILM modelmaker Bill George, it began it’s life as a series of sketches, referred to as “B fighter” or “Rebel Alien Fighter”. The second name is rather telling, as the very nature and design of the fighter varies significantly from the more traditional rebel fighters like the X-wing and Y-wing. When Return of the Jedi was being developed, George Lucas instructed his ILM team to create new designs for the rebel fleet, showing that the entire Alliance was assembled to take on the Empire’s second Death Star. This team created numerous new craft that ultimately made it on screen, including Admiral Ackbar’s iconic flagship Home One, two other variants of the Mon Calamari star cruiser (winged & wingless), a smaller vessel now christened the Dornean Gunship, the speedy A-wing, and the B-wing. » Read more.. It has been quite an exciting few weeks in the world of Star Wars. As we steadily creep towards the release of Episode VII: The Force Awakens, the unstoppable juggernaut that is the Disney/Lucasfilm team continues to release more and more information about the new movies (namely the excitingly titled Rogue One), a whole slew of new novels & comic series that will flesh out the canon of the New Expanded Universe, and hints begin to emerge on the potential for Star Wars to appear on the small screen in a live action series. It is an exciting time, to say the least, and you will be forgiven if the sudden deluge of new and exciting information causes you to momentarily squeal like your inner fanboy or fangirl. While we all spend our free hours (WARNING: doing this at work reduces productivity, or so my boss says) reading, discussing, and analyzing what we DO know, let us not forget the greatest joy of all- SPECULATION! And there is nothing more exciting to speculate about than the unbridled potential of a live action TV series. There are all kinds of directions a TV series could go. Bounty Hunters, new Jedi, entirely new characters- the possibilities are endless. And yet, if Rogue One‘s title is any indication, there is one group above all others that has a sufficiently built-in fan base to sustain a TV series: starfighter pilots. » Read more.. Despite nearly a decade and a half of Star Wars media being inundated with the look & feel of the Prequel Trilogy and the subsequent Clone Wars series, the aesthetic of the Original Trilogy is back in a big way for Episode VII. That J.J. Abrams and his crack team are doing this is no surprise, given that the majority of them grew up during the original releases of Episodes VI, V, and VI. This really sank home for fans last month when an intrepid fan with the skills of a Bothan spy released several images and aerial drone shots of an Episode VII set. And not just any set. This set had all of the classic trappings of a Rebel Alliance base. As a 31 year old fan who encountered Star Wars as a young kid via VHS tapes and had his love of it sustained by the Expanded Universe, the sight of a Rebel base is exactly what Star Wars is all about. The set has all the familiar elements of Yavin Base, Hoth Base, and the hangar on the Rebel flagship Home One. When I first saw these images, I felt a level of excitement for Star Wars that I hadn’t felt in a long time. My beloved EU had died a slow and painful death, so my interest in Star Wars (well, at least in new stories) was dying too. The announcement of the Sequel Trilogy changed all this. Suddenly, there was that old excited feeling and the sense of wonder. » Read more..
Let me get the obligatory “statement” out of the way. I love Han Solo, Luke Skywalker, and Princess Leia. The Big Three, along with loyal Chewbacca, dashing Lando Calrissian, and the lovable duo of C-3PO and R2-D2 are the core of the Original Trilogy. The annoucement that many of these characters (minus Lando, at least for now) were returning for Episode VII was positively received by both fans and the media. Like I said, we all love the main characters of the Star Wars Original Trilogy. But some of us love other characters more. Sacrilegious as it sounds, many fans are equally passionate about the movie’s minor or background characters. Admiral Ackbar (full disclosure, this author’s favorite character), Boba Fett, General Veers, Mon Mothma, and Admiral Piett are all examples of very popular characters. Some had true supporting roles (Ackbar, Piett), while others either just mostly stood there (Boba Fett) or had one scene (Mon Mothma). Many of these characters owe their increased popularity to the old Expanded Universe, recently rebranded as “Legends”. But, when it comes to supporting characters who are wildly popular, and spawned comics, books, and games, one man stands head and shoulders above the rest (sorry Boba Fett, you don’t get any love in my article). Wedge Antilles. » Read more..
My fellow ETE writer and friend across the pond, Ben Crofts, recently wrote a fantastic article praising the Empire’s iconic and menacing Star Destroyers. The Star Destroyer certainly is famous and its place in the opening scene of A New Hope has forever secured its place in cinematic history, but there is a lovelier belle at the ball. She has curves where it counts and it is the best damned looking warship in the Original Trilogy. Who is this lovely lady, you ask? The Mon Calamari Star Cruiser. Move over, Star Destroyer, ’cause this gal can catch more second glances than a Twi’lek dancer in Jabba’s palace. No longer are Rebel forces stuck going into battle in rusty old blockade runners or secondhand frigates. They need not be self-conscious of their 20 year old Y-wings or repurposed Separatist ships. Now, for the first time, they have a capital ship capable of going toe to toe with the Empire’s Star Destroyers. designed, so I am told by retired Mon Cal engineers, to lull Imperials into a false sense of security, only to fall prey to her deadly wiles. So scared was the Emperor of these winged wonders that he took a break from taunting Luke to tell the Death Star’s commanders to take her out, lest his forces surrender immediately! Alright, I have had my fun at the expense of those boring Kuati wedge ships. Backbone of the Alliance Navy and pride of the Mon Calamari, the Mon Cal cruiser is the culmination, from a visual standpoint, of all the progress and growth that the Rebellion made from its early victory at Yavin to the climactic space battle over the forest moon of Endor. When fans were introduced to the Rebels in ANH, they had a handful of snubfighters to throw against the Empire’s mighty Death Star. By the end of The Empire Strikes Back, the Rebel Fleet is depicted as collection of transports, smaller craft, and a Rebel cruiser converted into a Medical Frigate. After the loss of Hoth, the last shot we see of the Rebellion is a ragtag bunch of freedom fighters hiding at the edge of the galaxy. All seemed lost. Enter Return of the Jedi and the best damned fleet shot in the entire movie. Fans, just getting over learning that Leia is Luke’s sister and listening to Obi-wan warn Like about the powers of the Empire, are treated to an awe-inspiring and majestic shot. The Rebel Fleet, led by the impressive bulk of Home One, flagship of Admiral Ackbar. As the massive Star Cruiser glides across the screen from left to right, tiny X-wings dart across the screen, while other assorted Rebel warships flank the admiral’s cruiser. For the first time in three movies, the Rebels are shown to have the firepower needed to tackle the Imperial fleet head on. They will have their work cut out for them, they will suffer some significant losses, but ultimately the Rebels and their Star Cruisers will beat the Empire’s best and go on to lead the charge in liberating the galaxy. 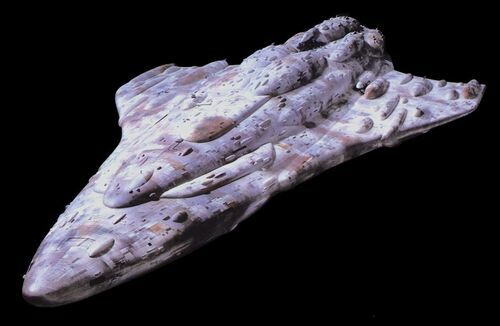 Ultimately, the question of whether the Mon Cal cruiser is better or worse than the Star Destroyer is a discussion that Fleet Junkies around the world have debated (and no doubt will continue to) for decades. Some will agree with me, others disagree, and yet others will say that the curvy cruisers and their wedge shaped opponents are actually like peas & carrots, best when served together. Well, I like carrots. Wait, or is it peas? Crap, did I leave my dinner on the stove?